During the first week of October 2012 the Ashby Stock Farm was buzzing with activity. Nancy Later Lavoie, the newly appointed Region 8 (encompassing New England and New York) coordinator and her husband Matt hosted Conrad Schumacher for an amazing educational event. A former German national dressage team member, Conrad Schumacher trained under the late German World Championship and Olympic medalist Josef Neckermann from 1968 to 1978. After winning the Hessen State Championships in 1982, he has focused on teaching and coaching. Mr. Schumacher lives in Germany at his farm The Hofgut Neuhof in Neu-Isenburg. “This was our second event of this type at The Ashby Stock Farm and the support was phenomenal” Nancy said, “the helpfulness of the families and camaraderie of the Jr/YR’s created an atmosphere that exceeded our expectations.” Attendees were able to bask in the comfort of the farm’s facilities while enjoying great teaching and beautiful horses. The first two days of the clinic were made available to adults. This time was filled with private lessons for trainers and other interested individuals from all over New England. Conrad Schumacher is a master in the art of Classical German Dressage. His training methods are kind to the horses and require timing and feel from the riders. These lessons were great for the auditors as well as the riders because his explanations are so detailed and the transformation so complete. He has a wonderful ability to take the riders back to the basics and create a happy and relaxed connection, from there it is amazing to watch how easy the movements develop. “Always go back to the basics, when you have that you have everything,” Mr. Schumacher teaches. The weekend was dedicated to the Region 8 youth. This was two days filled with private and semi-private lessons, lectures and demonstrations. The girls learned about applying correct aids, proper riding position and good timing from Mr. Schumacher. There was also a lunch lecture by William McMullin (r) Saturday. Mr. McMullin helped the girls to understand the judging scale and discussed the strategy behind gaining points with good riding and preparation. This included a beautiful test demonstration by Taylor Lindsten and her Dutch gelding Raoul, and was followed by open discussion about the points afterward. In addition Dr. Brett Gaby from Essex Equine was on hand Sunday to give a talk about sport horse soundness. Dr. Gaby gave an informative presentation about early season soundness exams, maintaining long term soundness and planning for critical treatments and medication administration. This was followed by a bandaging demonstration and practical exam by Nancy Lavoie. The theme throughout the weekend was preparation, preparation, preparation. Whether we were talking about training, test riding or the horses soundness, preparation was the key to success. The group of Jr/YR’s was eager and receptive to the wealth of information being made available to them. The auditors present were also treated to these informative lunch lectures. Some of the riders in attendance were part of the Emerging Dressage Athlete Program developed by Lendon Gray, Robert Dover and Courtney King-Dye. 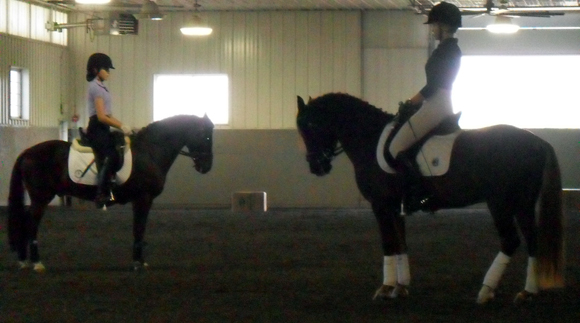 These girls were being evaluated for the Horse Mastership Program that will be held this winter in Wellington, FL. 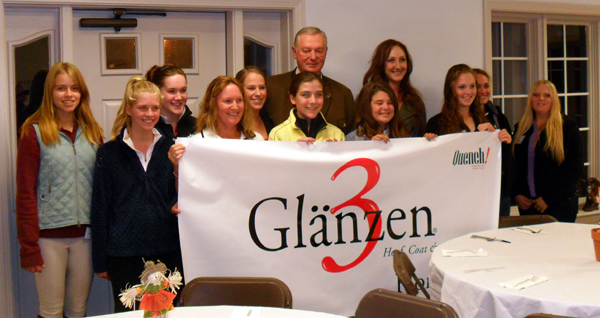 All of the Region 8 girls were able to apply for sponsorship through the Emerging Dressage Athlete Program and Lendon Gray’s Dressage 4 Kids. This wonderful learning opportunity was sponsored in part by Jeanne and Charlie Parlee, owners of the Ashby Stock Farm, Conrad Schumacher, Dr. Brett Gaby, William McMullin, Ariel Matisse, Cunningham and Cunningham Livestock Insurance, European Horse Trade, Carousel Dressage Horses and Matthew and Nancy Lavoie. Participants in the clinic included, Susan Mercer (MA), Gayle Paquin (NH), Leah Jamieson (MA), Maggie Batievsky (Peru), Shan Lawton (MA), Jamie Lee French (NY), Nancy Later Lavoie (MA/FL), Donna Cameron (MA), David Thind (MA), Ariel Matisse (MA), Taylor Lindsten (AZ), Susan Rainville (MA), Caroline Forsberg (MA), Meghan Drysdale (MA), Maggie Mann (MA), Alison Redston (MA), Jessica Hainsworth (NY), Marissa Pellegrino (MA), Mary Louisa Jones (MA), Jackie Cartesio (NY), Brittany Lincoln (MA) and Callie O’Connell (MA).